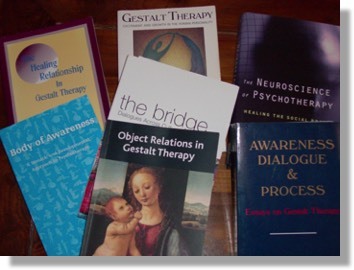 Gestalt therapy has its roots in psychoanalysis. The founder of Gestalt therapy is often referred to as Fritz Perls, although, it was he and his wife, Laura Perls (formerly, Lore Posner) who developed the approach in the 1940’s and 50’s. The Perls' were German Jews who fled their country when Hitler and the Nazis rose to power. After a short stay in Amsterdam and South Africa, they settled in the USA. They were drawn to Freud's concepts in psychoanalysis and after having their own analysis, they subsequently became dissatisfied with some aspects of it. So, whilst maintaining a partiality for some aspects of psychoanalysis, including strands of Reichian Character Analysis, the Perls eschewed other aspects. Adding to this theoretical foundation, they drew strands together from several other diverse traditions, such as: Existentialism, Phenomenology, Gestalt Psychology, Field Theory and Eastern Philosophy. Fritz Perls called this new interwoven approach Gestalt therapy. Whilst living in New York, the Perls' met Paul Goodman, an anarchist philosopher whose work included a critique of competitive consumer society; and making a stand for more inclusive, meaningful relationships and societies. They also met Ralph Hefferline, an American psychology Professor. It was from here that Fritz Perls, Paul Goodman and Ralph Hefferline (often referred to as PHG) articulated Gestalt therapy in their 1950's seminal book, Gestalt Therapy: Excitement and Growth in the Human Personality. ‘Gestalt’ is a German word for which there is no adequate English translation, but it sort of means whole, configuration, a unique patterning. As PHG explain, experience occurs at the boundary between an organism and its environment, primarily the skin surface and the other organs of sensory and motor response. What is real are the "whole" configurations of this functioning; some meaning achieved, some action completed. The word ‘Gestalt’ is therefore indicative of core features of the approach in that it gives attention to the whole person, that is, mind, body, thoughts, feelings, what is in awareness, what is out of awareness and to the interrelational functioning patterns. The focus is not simply on the whole person in isolation, but rather on the whole person in a field context, that is, on the person in relation to the therapist and in relation to their wider relational connections outside of therapy and what gets co-created within those environments. Embodied within the Gestalt approach is the premise that meaningful change occurs at the contact boundary with an authentic other. Subsequent to the articulation of Gestalt therapy in the 1950’s, several variations of the approach have developed amongst trained Gestaltists, who have different leaning preferences towards particular strands of the approach and who formulate their own amalgamations of those strands. However, what continues to lie at the heart of the approach is a belief that our relationships with others are an essential part of our existence. It is how we develop our sense of who we are. This undoubtedly affects our sense of well-being, mood, self-concept, our ability to cope in difficult situations and our capacity to enjoy living. Research-based theories within neuroscience provide the physiological explanation to this phenomenon, in that they illuminate the inextricable links between relational contact and neurobiological processes that determine our development and functioning capacity throughout life. My own practice and understanding have been particularly influenced by findings in Neuroscience and by Phenomenology, Field Theory and some aspects of Object Relational Gestalt Therapy (ORGT) which highlights, amongst other important factors, ways of pitching the work at the level that each unique individual will be able to utilise and make sense of. In addition, my practice and understanding have been informed by the wide range of clients that I have been fortunate to work with.